Will Natural Gas Trucks Change Your Supply Chain? Unfortunately, I missed CSCMP this year. But, Dan Gilmore of SCDigest recorded an interview with T. Boone Pickens on the future of Natural Gas Trucks. With the low price of natural gas, it is no wonder the supply chain community is starting to look at replacing diesel powered trucks with trucks running on natural gas. The interview states that the the cost of a gallon of Liquefied Natural Gas (LNG) is about $2.80 compared to about $4.50 for diesel. I don’t know if both types of vehicles get the same miles per gallon and have the same capacity, but assuming they are comparable, this is a significant drop in the cost per mile. With a much lower cost per mile, this means that transportation becomes less expensive relative to warehouses and inventory and the difference between truck and rail decreases. Both of these trends should push you to need fewer warehouses. In the short-term, without a network of fueling stations, it may also mean you design your network so that you can take advantage of natural gas by locating warehouses where you can access LNG. In any case, this is just one more reason for staying on top of the design of your supply chain. Supply chain managers watch the price of oil carefully. The price of oil is closely related to the price of diesel fuel and that is closely correlated to total transportation spend. An IBM blog post provides additional information on how this impacts the supply chain and a link to a nice article in The Wall Street Journal on the same topic. In the book, we provide a mini-case study showing how oil prices impact diesel costs. 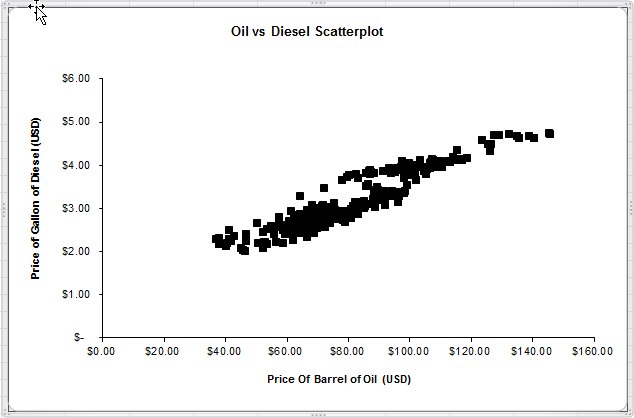 The following scatterplot shows the raw data– the weekly price of oil vs the weekly price of diesel for 300+ observations. This case study as well as the links above provide a nice introduction to the impact of oil prices on the supply chain.